Good Grips stainless steel cutlery features a special twist built into the metal shaft which allows the user to bend bend spoons and forks to any angle both left and right. Good Grips stainles steel cutlery features a special twist built into the metal shaft which allows the user to bend spoons and forks to any angle both left and right. They have a soft,comfortable grip with flexible ribbing that keeps the utensil in the hand even when wet. All utensils are dishwasher safe. 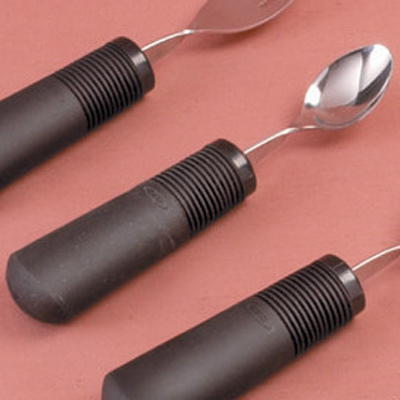 Utensils available:- Fork, Youth Spoon, Teaspoon, Dessert Spoon and Rocker Knife.